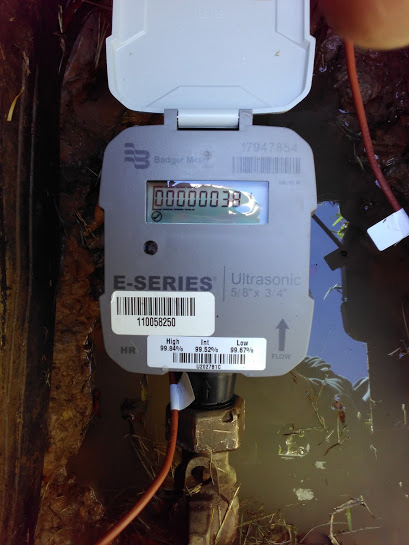 The Northampton MUD recently approved the installation of smart water meters. These systems help residents make informed decisions about their water usage and help improve water conservation. Additionally, these meters utilize electronic sensors to measure water flow and are more accurate, especially during low flow usage. Beginning in December, the District will begin replacing the old mechanical meters with new digital ones. Hays Utility South Corporation will begin installation of the new meters in the older homes and move northward through the subdivision to the newer homes. Scheduled completion is late 2018. The Eye on Water app offers customers the ability to keep an “Eye on Their Water” thereby assisting in conversation and cost reduction. Once installed you will be able to register on-line to monitor your water use. Flow is measured electronically at hour intervals, and updated every 24 hours for billing and leak detection. There is also an app available for smartphones from iTunes and GooglePlay, allowing you to check your meter from your iPhone or Android at any time. You will receive instructions on how to use the software in an invite letter after meter installation. Once you have your new smart meter, go to www.eyeonwater.com to register. For more detailed information about what Eye On Water can do for you, click here. If you have been notified that you have had a smart meter installed at your home, the new meter will allow you to make informed decisions about your water use. To get the most benefit from your new meter, please take the time to create an account at www.eyeonwater.com. After you register your meter you will see graphical representations of your water use which will help you lower your water cost and conserve water. You can also set up leak detection notifications. Visit www.eyeonwater.com on your computer using a supported web browser. You will get a confirmation email from BEACON. You must verify your email address by clicking on this link. Once you do, you can sign in using your email and password. Download the free App to your iPhone or Android Phone. An email will be sent to the address you provided. Click or tap on the link in the email to verify it is valid. You can now sign in to your account. Please note you cannot create a leak alert from the app please use www.eyeonwater.com. You may contact the Northampton MUD at 281-376-3499 if you have questions. A leak is determined if the meter records continuous flow through the meter every hour for twenty-four hours. Common causes are sprinkler system leaks, leaking toilets, or a dripping faucet. We urge you to check your home for potential problems. Shut off the water service valve where it enters the house. Do not turn on any faucets or flush any toilets during this phase of the test. Also shut off the water supply to the sprinkler system. Check the meter for flow. Open the cap of the meter to display the digital readout. If the digital readout is showing flow, there is a water leak between the meter and the house. If there is no flow of water, there is no leak between the meter and the house. Open the water service valve to the house. Check for flow. If all faucets are closed and no toilets are being flushed, and there is flow, a toilet may be leaking. Shut off the water service valve where it enters the house. If there is no meter flow, open the valve to the sprinkler system (do not activate the sprinkler system, just open the water supply to the system). If the meter now indicates a flow then there may be a leak in the supply line to the sprinkler, a valve to each circuit, (or in the case of automatic sprinklers, a solenoid valve to each circuit), or a combination of any. If so, you may want to call a plumber or a landscape irrigation company to investigate further. It is the utility district’s desire for each resident to use as little water as possible, and for each to get the full benefit of what is paid for. Please always heed the red flag warning of a high-water bill or leak detected by your smart meter and act promptly to resolve the issue.